Savon Patterson, 21, has been looking for full-time work to meet family obligations ever since he finished serving time for vehicular burglary a year ago. A job offer as a delivery driver was rescinded after a background check. Savon Patterson struck the fingers of his right hand with his left index finger as he counted his financial obligations one-by-one. Patterson soon ran out of fingers. “I got a lot,” he said. While many people in the Chicago area struggle to pay their bills, Patterson’s situation is more complicated than most. He has a criminal record. To meet his responsibilities, he needs a full-time job. But to get a job, he must overcome the stigma and legal barriers faced by people with criminal records. Ex-offenders are expected to pay their debt to society, join the workforce and move on with their lives. But some laws and company policies bar employment to people with criminal records regardless of their qualifications or how long in the past their offenses occurred, making it extremely difficult for them to become contributing members of society. Patterson was released from Western Illinois Correctional Center just over a year ago after serving an 18-month sentence for burglary. He didn’t have a checking account. He didn’t have savings. His resume was negligible. During a visit with his parole officer two days after his release, he only remembers getting this advice: Don’t get into trouble. Charles Austin, 51, thought he was well on his way to putting his past behind him when he got hired to head the park district in south suburban Riverdale. But two weeks after starting, he was fired. A background check uncovered a 23-year-old conviction for possession and delivery of crack cocaine. A letter from the park board said it was “prohibited from employing Mr. Austin in any capacity.” They pointed to the Illinois Park District Code that imposes a lifetime ban on people with certain criminal offenses, including nonviolent drug crimes. Austin, who once struggled with addiction, completed 18 months of probation in the early 1990s. He was confined in Cook County Jail for three weeks, performed 200 hours of community service and paid a $200 fine, plus court costs. But he said he has paid an even higher price. His conviction limits his ability to support his teenage daughters. After more than a decade of working low-wage seasonal and temp jobs amid long bouts of unemployment, he would have earned $38,000 a year as park district director. A full-time job is a milestone experts in community re-entry say greatly increases an individual’s chance of success after prison. A new law in Illinois that went into effect Jan. 1 prohibits private employers with more than 15 employees and employment agencies from asking if an applicant has been convicted of a crime on job applications or early in the hiring process. Employers can only inquire about an applicant’s criminal history after the person has been deemed qualified for the position, after the interview process or after a conditional offer has been made in cases where no interview takes place. Advocates say the law is a positive step but more needs to be done. Community Renewal Society, The Chicago Reporter’s parent organization, advocated for the employment bill and continues to work on ways to lift job barriers for ex-offenders. Two bills stalled in the House Rules Committee – one introduced by Rep. Kelly Cassidy (D-Chicago) another by Rep. Camille Y. Lilly (D-Chicago), both a year ago – would abolish lifetime bans or other restrictions by some employers on job seekers with certain non-violent offenses. Austin was one of 10 ex-offenders who testified at a hearing of the Illinois General Assembly’s Restorative Justice Committee in Chicago last month to address barriers to employment in schools, park districts, transit authorities and health care. Illinois residents with certain criminal offenses face more than 100 professional, occupational and business license bans and restrictions to employment in a host of industries, including those expected to experience an explosion in job growth in coming years, such as health care. “When is a person redeemed,” she asked. According to the Illinois Department of Corrections, 40 percent of the 30,000 inmates released during the fiscal year spanning June 30, 2013 to June 30, 2014 returned to 10 impoverished ZIP codes in mostly black South and West Side neighborhoods where unemployment rates frequently top 20 percent. One of those ZIP codes is 60628, where Patterson lives. It includes parts of Washington Heights, Roseland and West Pullman — and had an average unemployment rate of 24 percent from 2009 to 2013, according to the Census. Although Roseland resident Charles Chapman missed most of his grown son’s childhood during 24 years in and out of prison, he wants to help support his daughters, 8 and 12. Since his release after serving a 6-year sentence on felony drug charges, he’s applied at various hotels and retail stores for work without success. His last job was in 2003 when he worked as a dishwasher at a South Shore restaurant. Patterson, who lives with his grandmother, his daughter and the 3-year-old’s mother in Washington Heights, has faced a string of rejections in the year since he finished an 18-month sentence for vehicular burglary. A job offer as a delivery driver was rescinded after a background check. 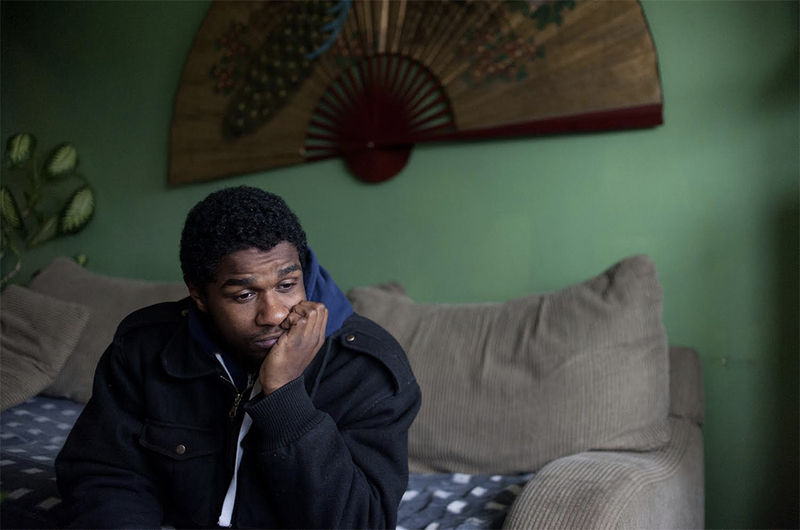 He works part-time as a construction laborer two to three times a week and wants to enroll in an advanced construction program at Joliet Junior College but can’t afford it. Austin’s future may be even more uncertain. The state revoked his commercial driver’s license in 2009 due to $5,700 in unpaid child support. A judgment against him for those support payments taints his credit history. He doesn’t have savings or a car. Bouncing between relatives’ homes, he currently lives with his sister. He promised to pay her $125 a week for rent but often cannot afford more than $60. She’s given him three months to find somewhere else to stay. Austin makes $200 a week as a part-time shelter fund coordinator for the Chicago Coalition for the Homeless. Still, Austin has reasons to hope. He overcame an addiction to crack cocaine. He’s proud of his Certificate of Good Conduct from a Cook County Court judge, a symbol of how hard he’s tried to turn his life around. He also serves on the prisoner re-entry committee of the homeless coalition.